We are open to all those who seek an enjoying retirement environment and choose to make Villa Scalabrini their permanent home. We understand all those who want to enjoy their retirement disposing of their time to pursue their goals like traveling, socialising, concentrate on hobbies, without the hassle of having to worry about the running and maintenance of the family home, utility bills etc… We are also open to all those who are still able to lead a quite independent life, needing however assistance and care due to frail health. Villa Scalabrini Residential Home aims to foster and maintain the independence and well-being of all individuals living within by providing a person-centred care. The home is fully equipped to cater for a wide range of needs, from the able-bodied to those requiring assistance with mobility or conditions such as mild dementia, Alzheimer or Parkinson’s disease, stroke and diabetes. 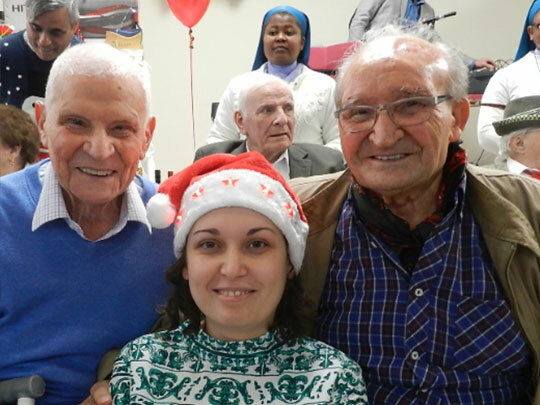 Villa Scalabrini Residential Home provides a dementia friendly ‘Village’ supported by trained staff to offer individual dementia care and support. 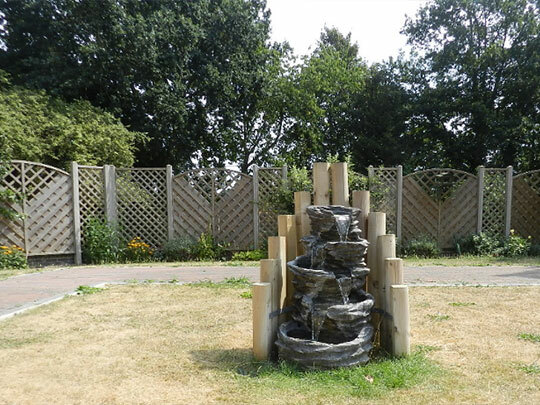 The dementia friendly area (including a dementia friendly garden) has been designed and adapted to the specific needs of the individuals to offer them as much independence and stimulation as possible. The specific decoration aims at helping people maintaining their independence and dignity. The Dementia ‘Village’ aims at creating a better qualified service with a person- centred care approach, and environment that respond to the particular needs of elderly people affected by dementia. At Villa Scalabrini, we want people, that are affected by dementia, to be cared for in an environment that feels like home without compromising safety but promoting well-being. Villa Scalabrini has been touched by the life of so many people, who have been a part of our history. We are extremely proud of having been part of their life. The departed are part of our history and part of our present and they will never be forgotten. Having this in mind, we have established a remembrance garden. At the very centre of this garden there are two trees, the trees of life, with the name of all those who passed away at Villa Scalabrini. We invite families and friends of the departed to visit this remembrance garden as a way of making a connection with their loved ones. Villa Scalabrini offers care services that help recovery and to rebuild independence following surgery interventions or illnesses. Our caring and compassionate staff is here to assist you managing the recovery process. After this period you may decide to go back to your home or to stay with us permanently. This service is offered to all individuals on a regular basis. Get rid of loneliness and isolation. You may spend your time at Villa Scalabrini during the day and still go back home for the night. Why stay on your own, when family and carers go to school, to work? We offer day care providing exciting and stimulating activities, companionship, within a friendly and safe environment. Individuals can carry on enjoying the services they have always used, and nothing is better than being able to have the hair done in a professional way. Our experienced hairdresser together with a newly refurbished hair salon renders this experience even more exiting. The home is ‘odour free’ at all times thanks to our great laundry service, as freshly laundered clothes and daily linen help to keep the individuals clean and feeling dignified at all times. We offer a great variety of foods to support individual nutrition needs. Our experienced Sicilian chef makes sure the individuals profit from a healthy and balanced diet. The individual’s medical needs are looked after within the environment they call ‘home’. A wide range of medical professionals, from doctors, mental health team, dentist and hearing, make sure the medical needs of the individuals are offered in familiar and safe environment. New studies have demonstrated how music therapy can provide significant benefits for people living with memory difficulties and dementia. 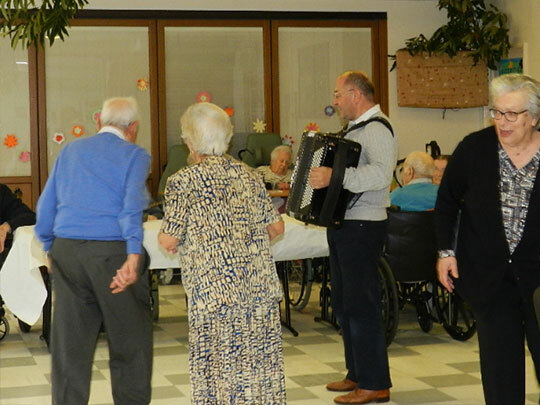 The elderly are offered music therapy that benefit their mental, spiritual and physical wellbeing. The visiting qualified optician service looks after the eyesight of all individuals in need, using the latest mobile optical equipment, making sure the individuals have a full eye whenever required. When possible and advisable, residents are to have the opportunity to interact with pets. Pets were part of the daily life of most individuals before they come to live in Villa Scalabrini. Therefore, we offer pet therapy as a great opportunity for individuals to continue benefiting from interaction with pets. We have a dedicated team of physiotherapists who are available to provide person centred therapy aiming at prolonging independent skills & realisations. The charity is open to individuals of all faiths and beliefs and also to all those who don’t have a faith or belief. The home has 24/7 spiritual services on offer to all those individuals seeking them at this stage of their life. A team of religious sisters and the chaplain Priest offer daily religious services making themselves available at all times to spiritually assist all those in need.